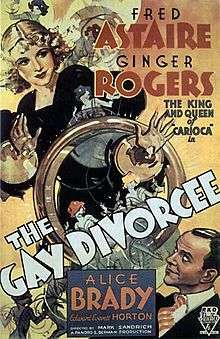 The Gay Divorcee is a 1934 American musical film directed by Mark Sandrich and starring Fred Astaire and Ginger Rogers. It also features Alice Brady, Edward Everett Horton, Eric Blore and Erik Rhodes, and was based on the Broadway musical Gay Divorce written by Dwight Taylor from an unproduced play by J. Hartley Manners, which was adapted into a musical by Kenneth S. Webb and Samuel Hoffenstein. The film's screenplay was written by George Marion Jr., Dorothy Yost and Edward Kaufman. Robert Benchley, H. W. Hanemann and Stanley Rauh made uncredited contributions to the dialogue. The stage version included many songs by Cole Porter, most of which were left out of the film, "Night and Day" being the only exception. Although the film's screenplay changed most of the songs, it kept the original plot of the stage version. The film features three members of the play's original cast repeating their stage roles - Astaire, Rhodes, and Eric Blore. The Hays Office insisted on the name change, from "Gay Divorce" to "The Gay Divorcee", believing that while a divorcee could be gay or lighthearted, it would be unseemly to allow a divorce to appear so. In the United Kingdom, the film was released with the original name of the play, Gay Divorce. The Gay Divorcee was a box office hit and was nominated for the Academy Award for Best Picture in 1934. This film was the second of ten pairings of Rogers and Astaire on film. Mimi Glossop (Ginger Rogers) arrives in England to seek a divorce from her geologist husband Cyril, whom she has not seen for several years. Under the guidance of her domineering and much-married aunt Hortense (Alice Brady), she consults incompetent and bumbling lawyer Egbert Fitzgerald (Edward Everett Horton), once a fiancé of her aunt. He arranges for her to spend a night at a seaside hotel and to be caught in an adulterous relationship, for which purpose he hires a professional co-respondent, Rodolfo Tonetti (Erik Rhodes). But Egbert forgets to arrange for private detectives to "catch" the couple. By coincidence, Guy Holden (Fred Astaire) an American dancer and friend of Egbert's, who briefly met Mimi on her arrival in England, and who is now besotted with her, also arrives at the hotel, only to be mistaken by Mimi for the co-respondent she has been waiting for. While they are in Mimi's bedroom, Tonetti arrives, revealing the truth, and holds them "prisoner" to suit the plan. They contrive to escape and dance the night away. In the morning, after several mistakes with the waiter, Cyril Glossop (William Austin) arrives at the door, so Guy hides in the next room, while Mimi and Tonetti give a show of being lovers. When Cyril does not believe them, Guy comes out and embraces Mimi in an attempt to convince him that he is her lover, but to no avail. It is an unwitting waiter (Eric Blore) who finally clears the whole thing up by revealing that Cyril himself is an adulterer, thus clearing the way for Mimi to get a divorce and marry Guy. The Continental (w. Herb Magidson m. Con Conrad) which won the first Academy Award for Best Original Song, and is the music to the twenty-minute dance sequence towards the end of the film, sung by Ginger, Erik Rhodes and Lillian Miles, danced by Ginger and Fred. Arthur Fiedler and the Boston Pops Orchestra recorded the music in their very first RCA Victor recording session, in Boston's Symphony Hall, on July 1, 1935; the recording can be heard on Youtube. According to RKO records the film earned $1,077,000 in the US and Canada and $697,000 elsewhere resulting in a profit of $584,000. ↑ ReelClassics.com (2008-12-16). "Ginger Rogers & Fred Astaire 2: The Gay Divorcee (1934) at Reel Classics". Reelclassics.com. Retrieved 2016-07-23. ↑ "Talkin' Broadway Regional News & Reviews: San Francisco - "Gay Divorce" - 4/29/07". Broadwaytalk.com. 1932-11-29. Retrieved 2016-07-23. ↑ Churchill, Douglas W. "The Year in Hollywood: 1934 May Be Remembered as the Beginning of the Sweetness-and-Light Era" New York Times (Dec 30, 1934) Retrieved: December, 16, 2013. ↑ "The Gay Divorcee". New York Times. Retrieved 2008-12-07. ↑ "Earliest Videos/TV Episodes/Feature Films/Short Films/Documentaries/Video Games/Mini-Series/TV Movies/TV Specials With Fred Astaire And Ginger Rogers". IMDb.com. Retrieved 2016-07-23. ↑ "The 7th Academy Awards (1935) Nominees and Winners". oscars.org. Retrieved 2011-08-07.